Part of my role in developer relations is to work with startups who are using Google’s platforms, and for me, that mostly means people doing interesting things with HTML5 and the Chrome Web Store. Here are some early reports from developers of great apps which were present – and in many cases, featured – on the web store. It’s early days, but the reports here suggest there are benefits in terms of discoverability and usage. Thanks to the store, our user base has increased by 780%, achieving the goals we planned for the next 1/1.5 years within the first 3 weeks. Traffic of Todo.ly has increased even more – by almost 1000. #1 Results – The SlideRocket app on the Chrome Web Store received over 50,000 installs in the first 10 days of availability and the volume hasn’t yet dropped off. As much as 60% of SlideRocket’s daily lead flow now comes from the Chrome Web Store. #10 The revenue share is only 5% – With all of the benefits in points 1-9 we feel like sharing 5% of our revenue with Google is a small price to pay. Compared to the other marketplaces and apps stores which usually charge between 20% and 25%, this is kind of a bargain. First, thanks to the almost 30,000 users who have installed LucidChart to date, we are one of the top paid apps and also one of the highest rated apps in the Web Store. Google rotates the applications that are featured in the Web Store, so LucidChart has been both featured and not featured in the store. While featured status definitely brings a significant bump in overall exposure and traffic, we have found that the store still brings an important volume of users even when unfeatured. So the Web Store can be an important driver of traffic and user growth for any web app. They also comment on the nature of users on the store. I think this is an overlooked-point – we often hear X store has X number of users, but the nature of the users and the way they reached the store should also be a factor. Second and perhaps just as significantly, we’ve found that the Chrome Web Store brings really well qualified traffic to LucidChart. Our user signup rate for visitors via the Chrome Web Store is about 75% higher than traffic from other sources. So the store not only brings significant numbers of new visitors to our site, but it has an even larger impact on the number of new users we’re registering. In fact, it turns out that a visitor to our listing on the Chrome Web Store is almost as good as a visitor directly to our own site. These days, there are many significant platforms for an HTML5-powered app, beyond just running in web browsers, and I think developers who can leverage them will do well. 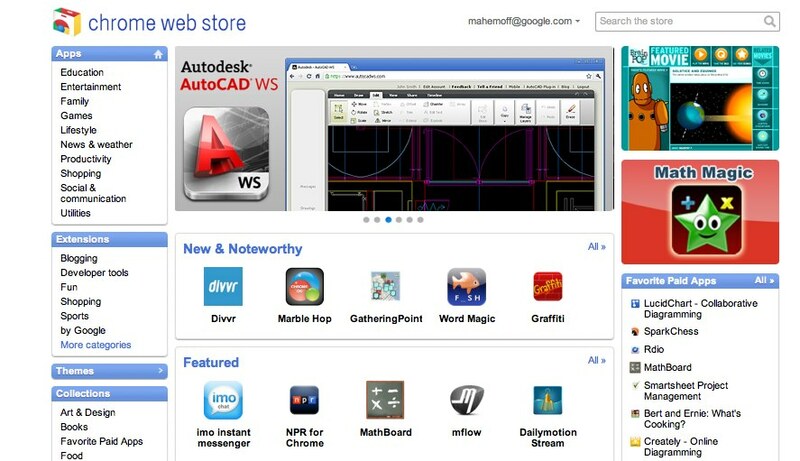 Chrome Web Store is one of those platforms; others include the Android Market, Apple’s iTunes, and so on. But wait, aren’t those “just mobile” platforms? No – aside from the fact that “mobile” means all manner of tablet, phone, and PDA form factors – Android apps also run on TVs, for example, and HTML5 can be the user-interface driver behind that 10-foot experience. And pure speculation, but I’m fully expecting HTML5 (or “open web standards” if you prefer) to power apps running on watches, cars, kitchen appliances, assorted furniture. It’s going to be perfectly possible to sell a single app on all of those platforms, where the majority – or even all – of the code is reused across the platforms. Beyond app platforms, you can also be featured in other ways, e.g. by using certain (non-app) platforms or APIs. To take a random – and very cool – API, meet Withings, a smart French outfit with wifi scales that upload your stats to a server. Here’s a page where they list apps using their API. Do you think it’s in Withings’ interests to promote these apps? Now, I do indeed work for a company with app platforms, so take this advice how you will. My main aim here is to highlight the benefits of working with platforms and to be aware that each of these platforms have developer relations people you may be able to work with, under certain conditions. Why would companies who run app platforms provide free to support developers, especially developers who are already committed to building apps for that platform? The reason is it helps ensure developers are building the best possible apps – the platform people see a lot of apps and know what works and what doesn’t. This leads to (a) great apps for users; (b) “role model” apps for other developers. I recommend you bear these goals in mind when you aim to be featured in the store, because they are important considerations when it comes to being featured. A further reason for developer relations is to listen to developers, and feed bugs and requests back to the platform’s engineers. In terms of the Chrome Web Store, apps that have done well are typically those which are following good UX principles and making the most of the platform at hand. In the case of an HTML5 app on the Chrome Web Store, making the most of the platform could mean apps using application cache, local storage, HTML5 notifications, CSS3 styling, etc. And for packaged apps, suitably leverage extension behaviours, since those are available to packaged apps. Finally, landing page matters, and fortunately for many developers, there is plenty of low-hanging fruit on their landing pages.